I want to raise my two boys to be worthy and healthy men. This has prompted me to study social dynamics, exercise, and other components of masculinity appropriate for today's society. The first series of essays begins by describing confidence as it applies to social situations. Then it reveals how most social norms are tests, not rules. Then I discuss how to connect with people in a fourfold manner, and the six kinds of flirting. Then I use concepts from all four prior essays to discuss romance. I am still working on an essay about grieving, mourning, and love. One essay trilogy explores motivation, changing habits, and how to be a chooser even when reactive. Also related to self-improvement is an introduction to muscle awareness, strength training, and stretching entitled meet your muscles. I used to do concealed carry, and wrote some thoughts about handguns. I have also blogged about body language and the harmful messages boys hear growing up. My essays focus on healthy masculinity, not how sexual attraction works or how it impacts dating or marriage. Although I do not agree entirely with the content, Ian's presentations The Red Pill Primer for Boys are the best resource I currently know about for teens to read about those topics. I know many fun math games. Most weeks I volunteer at my son's elementary school to share these games with all three first grade classrooms. Recess on a rainy day is more fun with my movement games. I have also compiled a list of tag variants. For fun moving and mixing at a classroom Halloween costume party I made a costume feature treasure hunt game. When in the car, or stuck in a line, my kids enjoy quizzing each other with these practice pages. Much more fun than flash cards! The arithmetic practice pages have a "trick" that always feels rewarding to find. There are two levels: beginning addition and subtraction and a version that also has some multiplication and division. The reading and spelling practice page makes a fun car game. One kid hold my phone, picks a word from the page, and reads it to his sibling. If the sibling spells it, huzzah and repeat! If the sibling cannot, then the sibling gets the phone and the first kid has to try to spell it—easier because the word was just in view to be memorized. 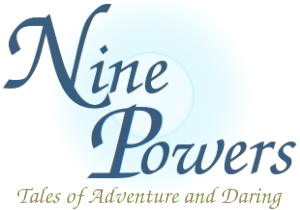 Nine Powers is my diceless, two-person role-playing game. It has its own section in my website, and a Google+ page I will eventually start using to share it with the world. My current character is Dhrun. 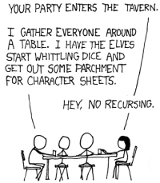 I used to play the Pathfinder role-playing game quite a bit, and enjoyed in its participating in its forums. My most memorable character was Quarrels, a giant rat who rode a dinosaur. My most recent character was an illusionist named Shayne Anigon for a play-by-post campaign. I once played a Juju Oracle, for whom I made a nice zombie template. Because some important Pathfinder rules are confusing I wrote and explanation of teamwork feats and pets, and analyzed of the rules about lighting, Stealth, and the Hide in Plain Sight ability. Pathfinder also has some "weak spots" that I filled with house rules. I used my knowledge of jiu-jitsu to create alternate wrestling rules. I interpolated additional poison rules. Because much of the old-school fun of RPGs is resource allocation, I created blessing cards as one method of making a climactic Pathfinder combat more exciting. Finally, I created a way to move beyond character clases whose foundation is changing class abilities into feats and then giving characters two feats per level. Pathfinder is currently play-testing an Occult Adventures book. So far it does little to add a truly occult mood to adventures, so I have invented paranormal house rules to fill that gap. I have invented lots of board games. Here are some of the best ones. I am not very good at the ancient game Go, but I enjoy it immensely. Here is my collection of internet links related to the game. I have written house rules for Mansions of Madness that allow all players to play an Investigator, taking turns with the role of Keeper. I have written house rules for Sherwood Showdown, my favorite kid-friendly card game. Here is how I learned to play Dominoes, as well as how I make the game's traditional trash talking kid-friendly. How do I know which stocks or ETFs to buy? You can read my strategy for investment picking. Once I know which stock or ETF to buy, how do I know when to buy it? You can read my strategy for investment timing. For most of my family's savings we use dividend investing. I manage my IRA with a certain style of sector investing. A slightly advanced topics is using options instead of limit orders to buy and sell stock. Finally, I describe the charities my family supports. Donating to charity is an important part of money management. By properly acquiring and cycling through four or five credit cards, each adult in the family can easily get 120,000 free airline mileage points every two years—enough to travel from the continental U.S. to Europe. This routine is limited by the "Chase 5/24 Rule" about how Chase only approves new cards to someone who has five or less new credit cards (from any company) within the past 24 months. A nice introduction to doing this is the ChooseFI Podcast #009 from 2017. Current details about relevant credit cards are maintained by Frequent Miler. Most airline mileage points are worth about 1 cent for travel in the U.S. (including Hawaii) or Asia, and 2 cents for travel to Europe. The website Award Hacker helps find the best deals for using mileage points to book flights. If you live near an airport used by Southwest Airlines, you may be able to get an unlimited use companion pass after acquiring a certain two credit cards. Beyond that, four cards are most popularly used to get free mileage points. Chase United MileagePlus Visa - The deluxe version provides free checked baggage, priority check-in, deals with Hertz and Hyatt, and non-travel purchases earn 50% more mileage points. Chase Sapphire Visa - The deluxe version provides $300 of free travel on any airline, and the best travel insurance. But households with at least two vacations per year might come out ahead by picking one or two deluxe versions to match the airline and/or hotel they use most regularly. Then use the wimpy no annual fee version of your other cards, just to get the extra free mileage points for new members. For example, consider the Chase United MileagePlus Visa. The extra 50% point gain from the deluxe version of is worth about $50 per $10,000 charged on the card—we can use $150 for this example. Two free checked bags for the cardholder and one companion is worth $60 per flight per person—we can use $240 for a parent and child traveling twice round-trip. That totals $390, meaning the nice airport lounge access, travel insurance, and other small perks are actually a reasonable $450−$390=$60 annual cost for this example family. If you have a favorite airline other than Southwest or United, you should obviously research the relevants cards for that airline. Anyone who takes trips of less than 1,150 miles distance, or who wants to travel to Europe or Asia, should also research whether the British Airways Card is useful. A cash back style card can also make a good fifth card for the cycle. As a rounded guideline, Chase points earn at a similar rate to airline points and transfer 1:1 into airline points, Hilton points earn three times as fast but only transfer 10:1, and Starwood points earn twice as fast but only transfer 3:1. The details are slightly more complicated. If you own a business, you can often acquire both a personal and business version of the same card. Getting two cards for each flavor of mileage points sometimes allows getting more overall points. It certainly can simplify travel planning by focusing your points into half as many flavors. Mileage points can be used for hotel rooms. But since my family is not picky about when or where to vacation (we just want one real getaway each year) we decided to buy the smallest possible "share" of GPX that gets us access to its insider weeks, as well as a free week somewhere every other year. Financially, with such minimal use of the system, it works out to about a 6% annual return on a small investment. That is a nice guaranteed return, and for us the "cost" of having the gains restricted to travel fits our family plans. From 2005 to 2015 I blogged. 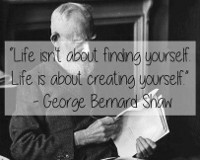 It helped me process my own thoughts, and keep in touch with family. But now I have other ways to do both. My family drives from Oregon to San Diego at least annually. So I have researched the best way to use Costco gas stations along I-5 to save us time, money, and hassle.